The information we receive from the media is not a guarantee of truth and fidelity. Everything that we read in the news line is nothing more than a point of a customized point of view of a particular journalist, analyst or philosopher. Because so it is necessary to write and paid for it. But what do you say about the project, which seeks to help the further development of journalism and struggles with the oppression of the truth, as well as unverified news? Completely anonymous, completely free. This is media content for everyone. 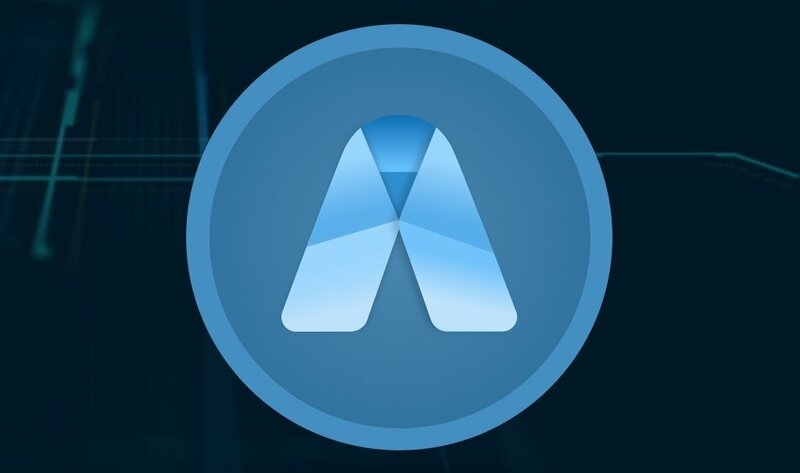 APRES is a decentralized platform based on modern blockbuster technology and using its own crypto currency to encourage users. The platform protects the interests of its participants and guarantees their complete anonymity, without collecting information about the user and his whereabouts. APRES connecting people and communities. Issuing news update and report by the people for their communities and the globe. Granting persons with the authority to report, telling each Story as it is whilst protecting their identity and location. After uploading the content to the resource, it will not be subjected to any changes, but will remain online until the end of its term. APRES does not have a central network of servers, so it exists directly on the user's device, making it impossible to delete it. It is necessary to be only one user online, so that the entire system is online. Users of the network will only be able to add information (comment, create posts), which will be stored in the blockchain, but cannot access the information of another user. Each file uploaded to the system will be encrypted, making it impossible to track its original location. This function will be available only to those users who downloaded the file for the purposes of anonymity. 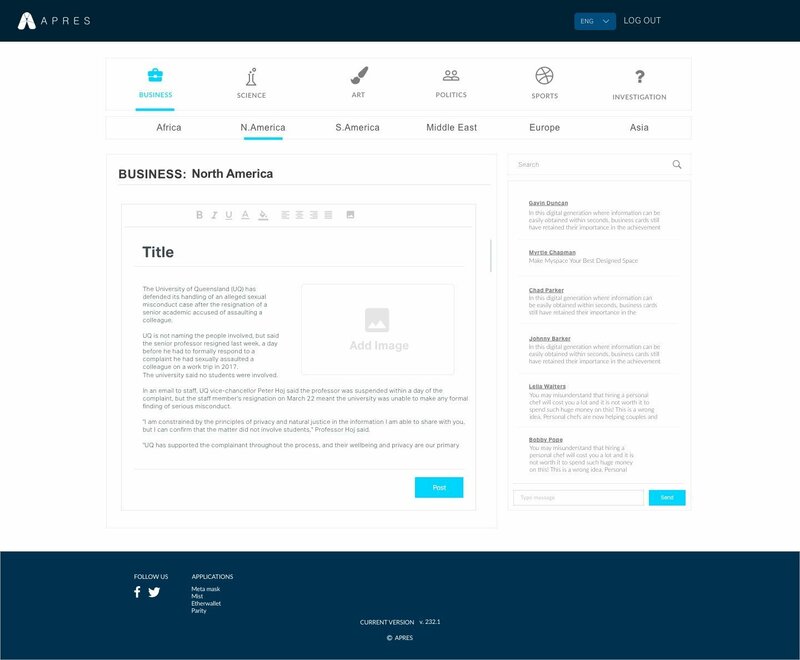 The main idea of the platform is to exclusively exist on the user's hard drive. Only you can decide whether to delete files or leave untouched. 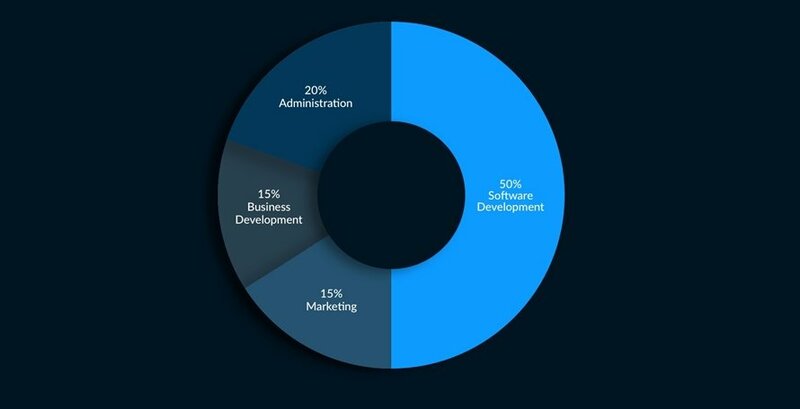 With the total number of tokens issued equal to 5 billion tokens APRES, 75% must be purchased during the pre-sale, and the remaining 25% will belong to the core development team. As soon as the ICO is over, the token will be included in the list of currencies on the exchangers. The start of sales of tokens has already begun in March 2018 and will last until June 2018. Or it will ends if the hardcap reaches 40.000 ETH. Economics professional focused on developing and streamlining procedures & finding innovatice and cost-effective solutions & finding innovative and cost-effective solutions. Highly experienced in UI/UX Design, Branding, Prototyping & Strategy for large scalable platforms. He has co-founded a world first property ecosystem for the Real Estaet industry. Proactive IT Systems Developer with experience in back-end & front-end web programming, relational databases, development & maintanance of complex web systems. Living in Belgium currently working for a cloud provider & has a master in electronics. Since graduating has worked as a systems engineer for Windows & Linux. 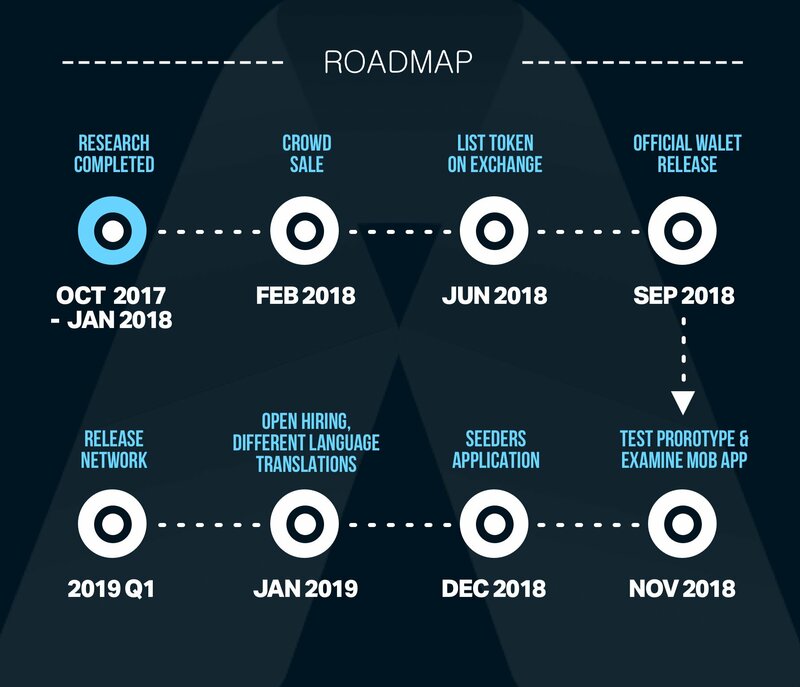 The main goal of the project is to provide its users with a complete decentralized new platform, which will be a means of expressing one's own thoughts. Each of its participants will receive the deserved attention and will have the opportunity to speak freely, which will increase the awareness of users in specific situations.